This lesson will continue where the last one left off. This time we will go over the consonants that make the [t] and [n] sounds in combination with a vowel. The [t] section in particular has two that need to be explained a little in depth, but the [n] section is rather simple and easy to pick up. You probably won’t need to do any extra work on learning this particular sound, just being aware of it is usually enough for most students. The other sound to highlight in this section is the つ [tsu] sound. This is created by combining the [u] vowel with the [ts] consonant combination that can be found at the end of English words such as “cats, suits, hits” and so on. It will probably feel a little strange at first making this つ sound, but it is very common in Japanese, so you will have to learn it and then practice it until it feels natural. Now that we are up to a total of 25 sounds and hiragana, we can start looking at more and more Japanese words to see how they sound together. Listen to and repeat each sound 3x or more. Pay extra attention when listening to and repeating the つ sound. Write out each hiragana 5x or more. Listen to and repeat the example words 3x or more. You’re doing pretty well so far! 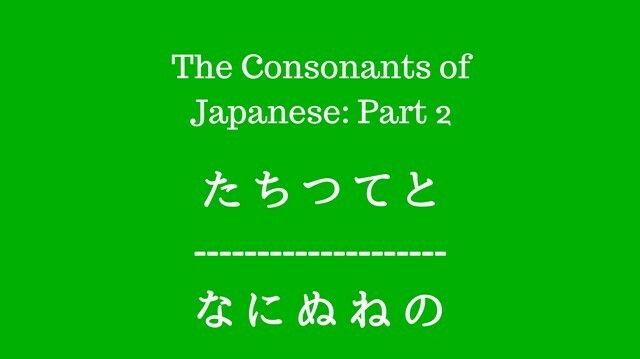 You are officially at the half way point for the basic hiragana and their corresponding sounds. Go Back to Lesson 4!